As it so often happens when an entity takes such a hard hit and people start fleeing the ship, leadership has to make a strong showing. “We’re actually winning, the enemy is on the verge of retreat, everything is fine, the enemy is the actual incarnation of Satan” etc etc etc. We’ve seen a taste of this in SMA’s internal chat channels, on their forums and their media site. However, recently SMA pulled all the stops. This goes above and beyond anything we’ve seen so far, by far. I’m going to call out some of the points, but in the mean time you can read the pastebin for yourself. They laid it on pretty thick right? We should clarify a particular word of importance: propaganda. Today the term generally is understood to mean a dishonest politically slanted message made to trick the reader in some way. The classical definition is simply the dissemination of information. It wasn’t necessarily honest or dishonest, it just was. So in theory you can have good propaganda and bad propaganda. An example of good propaganda can be a poster about recycling or taking care of the elders. An example of bad propaganda would be using nonfactual statements to demonize an individual or group of people. Think you got the hang of it? Alright now to go over all the laughably obvious points SMA was trying to make. 1. Right away the author makes a fairly bold accusation by naming their enemies the “RMT coalition.” This might seem like a funny troll type name, but it’s actually something Mittens himself claims. He found some old article from 2013 discussing some RMTer named Horus or puppet master or whoever and has tried to somehow link it to IWI and finally to TISHU and others. There’s absolutely zero proof of any such connection. But for the sake of argument let’s say Horus or puppetmaster or whoever else was RMTing through IWI. Does this somehow taint TISHU? Is the ISK we’re getting paid “RMT money?” Of course not. IWI isn’t buying ISK with real money. They’re making ISK through their gambling site. If they sold some of that ISK for real-life money that’s a separate issue than using some of their ISK profits to pay ISK to TISHU. Unless IWI is spending real money to buy ISK and then paying that ISK to TISHU, there’s no issue. But again this is assuming any sort of proof from CCP comes out even saying IWI is guilty of RMT. But of course this narrative is thrown out because of the enemy can be seen as a bunch of “RMTers” their credibility gets ruined. This is a desperate attempt at gaining the ethical high ground. 2. “Out of game profiteers” is another epithet being thrown around. It differs from the RMT narrative I assume and refers to some other means through which we are profiting. However, it’s ironic that both their coalition and their alliance have websites (TMC & DMG respectively,) both of which get peddled to their members, providing views which in turn provides profits for their site owners. I don’t think there’s anything wrong with that, but it’s really a case of the pot calling the snowball black. 3. “Every attempt at Fortress Fade has failed.” Truth of the matter is there haven’t been any attempts at “Fortress” Fade. TISHU’s contract was simply to destroy ships and cause as many problems as possible. Even the taking of Cloud Ring from SMA, in which their leader claimed SMA will “take over and freeport it to friendly entities,” was done at a lackadaisical pace in the spare time of a handful of people. Any entosising done in Fade by TISHU has been to draw out fights. 5. “Their own members are starting to question the campaign.” What members? Who? Literally nobody in TISHU is questioning this campaign. 7. Next, the author links some battle reports, none of which are particularly impressive, some of which have their coalition members on the wrong side. At best a sloppy attempt to skew the numbers. 8. Now it gets really good. In true CFC (now “Imperium”) fashion, they wheel out the good ol’ Band of Brothers trope. They point out how 3 BoB corps are in NCdot and 1 is in PL and how all of this is due to how much they are “obsessed” and “hateful.” For some reason any time someone wants to blow up spaceships north of Black Rise, it’s automatically due to some sort of obsession. They’re completely reliant on some space boogeyman myth to even motivate their members to log in. 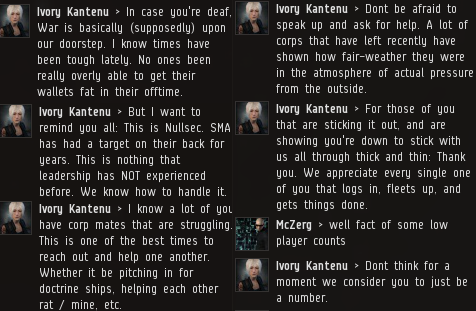 The “Imperium” is “providing guidance for new players and making Eve a better place” while NCdot and PL are “roving gankers” that hate Goons so much they’ll destroy the game if they can. 9. CCP Fozzie made Aegis sov to hurt the “Imperium.” Yes, because CCP Fozzie was a PL member. Furthermore this was done to weaken the “Imperium.” So not only is Horus the RMTer, I Want ISK and other alliances attacking SMA… but even CCP itself is now in on it. The whole narrative follows the story of Coyote Benihime’s transformation from being “Grr Goon” to loyal FC team member. The pieces is wrapped up with how SMA’s enemies are all bitter RMTers in league with “crime lords” while the “Imperium” wants to build homes for people and create things. The issue isn’t that SMA threw some propaganda into the mix. That’s normal and it can be fun. Certainly, TISHU blows through the meme market in the process. However, the problem is SMA tried to spin way too hard. This doesn’t come off as cool, smart and detached. It comes off as desperate. Don’t over play your propaganda. It was so cringy that Elise did the bro thing and wrote a morale speech for SMA. I leave you with the skillful words of Elise, neither exaggerating SMA’s successes nor ignoring the challenges still ahead.